I grew up working in my mom's home accessories and furniture store, Elegant Clutter. I learned about the importance of culture and loving where you work from her and her employees. Back in 2001 I started shopping at Sports Basement and loved it. I felt the same kind of connection with the store and employees that I had felt at Elegant Clutter (that's the highest praise I can give). Over the years I bought tons of clothes and equipment there and a lot of cool people I know do the same. 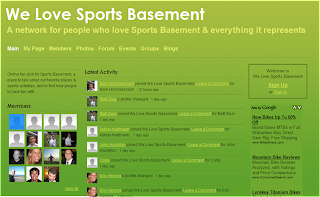 I started a social network called We Love Sports Basement, partly as an online fan-club for the store and the people who work there, and partly as a way for active people in the Bay Area to meet other active people. If we're all shopping at Sports Basement, and yoga-ing, jogging, biking or playing hoops, we might as well do it together. We have the best sporting goods store in the Bay Area in common, that's a nice little foundation to start building friendships on. The more the merrier, please invite your friends to join We Love Sports Basement . Employees of Sports Basement are welcome to join too.